Question: Does it make sense to perform compressed sampling if the non zero samples are grouped in time? If so, what is the minimal length of the vector x that should be acquired to allow full signal reconstruction (of at least the non zero pulse segments)? 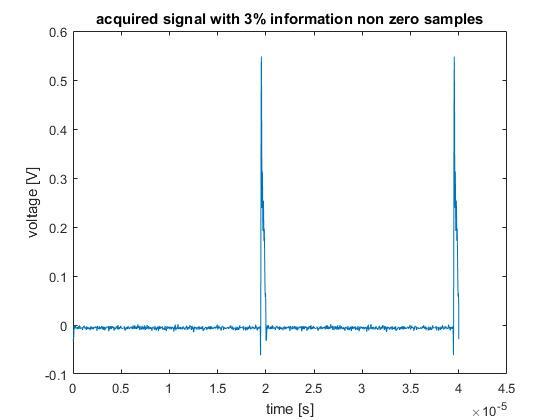 Situation: time sparse signal (+- 97 % of the samples at noise level), but the 3% non zero samples are grouped (periodic). I'm only interested in the pulse samples (so not in the noise floor samples). Does it make sense to perform compressed sampling if the non zero samples are grouped in time? Not the answer you're looking for? Browse other questions tagged sampling nyquist compressive-sensing compression or ask your own question. Is the basis of the sparse signal assumed known in compressed sensing?